Famous, stunning and exciting, the Alps offer a vast array of activities all year round from sporting ventures, national parks, distinguishable rich mountain flavors and scenic tours. Each season has its perks, but in our opinion none quite like the often overlooked Autumn. There’s no denying that the weather is perhaps the most anticipated part of the season. It’s the perfect time to relish the cool weather, warm colours and crisp mountain air this time of year brings. However, just because winter coats, cosy sweaters and pumpkins are starting to creep up on us does not mean it’s time to hide away and break out the SAD lamps! We think Autumn is awesome and there is no better place to embrace the fall than the Alps. The legendary mountain range stretching 750 miles from Genoa to Vienna traveressing Austria, France, Germany, Italy, Slovenia and Switzerland provides exceptional scenery and the perfect playground in the Autumn months. The bustling forests and mountainous rock formations provide a new canvas to appreciate each day that passes by changing their colours and shape as they start to loose their leaves. Local farmers harvest their crops and bring their herds down from the high mountains as the quaint alpine villages enjoy the quiet relaxed pace of life without the tourist droves. Meanwhile you can take pleasure in the simple things in life such as the fantastic food, unrivalled hiking or just simply taking in the sights. But honestly there are so many more great reasons why you should consider a trip to the Alps this Autumn. Across distinct mountain cultures and abundant attractions, the Alps are extraordinary so let’s take a look at our ‘Top 10’ Autumn pastimes and find out why we are looking forward to Autumn in the Alps. Autumn is probably one of the best times to go city exploring and those in the Alps have the added benefit of being surrounded by a pretty awesome mountainous backdrop and usually oozing in culture. Now the sweaty crowded shops, streets and attractions are behind us we can really get to discovering the true colours of a city and its hidden treasures a lot more comfortably. 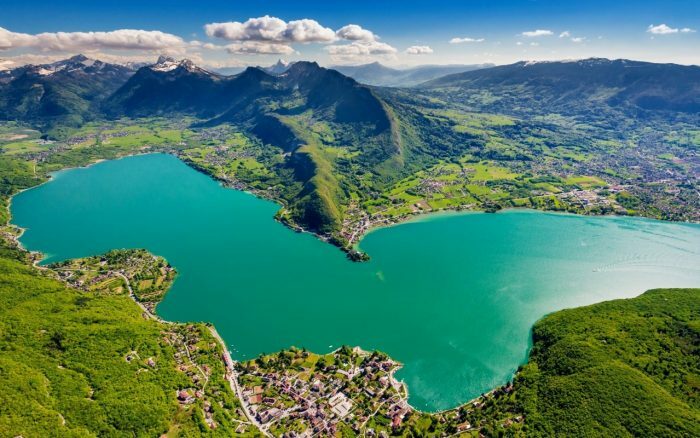 Some of those that immediately spring to mind have to be Switzerland’s diverse and sophisticated city of Geneva, cultural capital Bern and France’s postcard picture perfect, Annecy. For our detailed guide to the best city breaks in the Alps click here. Although the big alpine cities are full of history and culture it’s not until you venture out that you can experience the charming folkloric heritage and agriculture celebrated widely, and Autumn is the perfect time to do so. Ancient pastimes, working of the land and a way of life that has been retained for centuries can be experienced at the many autumnal harvest festivals and on unusual but interesting tours throughout the Alps. Whilst in the Alps why not take the opportunity to visit a museum and learn something about Alpine culture? There are plenty of museums to choose from depending on your location and interests. Those that like their winter sports, natural landscape and adventure can be amazed by the likes of the Musée Alpin in Chamonix, Swiss Alpine Museum in Bern or perhaps the Alpines Skisportsmuseum in Murren? Of course there are also many establishments other than for winter sports, some rather novel. Gstaad’s cheese museum for instance, or perhaps historical alpine art in Annecy. When in the Alps a grand Château or one of the countless churches every Alpine village boasts should be on the bucket list, many of them dating back centuries and beautiful to look round. One such establishment that should not be missed is the Château de Chillon situated on the western tip of Lac Leman at the foot of the mountains in the exclusive Swiss town of Montreux. Be inspired by the truly idyllic picturesque setting, over 1’000 years history and architecture like many before you, including world-renowned artists and writers Lord Byron, Jean-Jacques Rousseau, Victor Hugo, Delacroix and Courbet. A detailed account of our visit to Château de Chillon can be seen here. Before skiing became the popular and perhaps dominating recreation of the Alps it is today many alpine resorts flourished and depended upon their mountaintop wellness centres with most still brandishing natural thermals and impressive all-encompassing health spas today. Enjoy relaxing and unwinding with the top-notch steam, sauna, mineral water bath and jet facilities as well as massages and other health or beauty treatments. For a entirely luxury and prestigious spa weekend then you cannot beat the five-star spa hotels nestled into the swanky mountain resort of Megeve or for an authentic spa town experience in a legitimate thermal spring like those in Saint-Gervais-Les-Bains (France) and Pre St Didier (Italy). See our Mont Blanc Spa Guide for more details and recommendations. For tired legs there is no better way to explore the Autumn Alps and classic mountains than by train. Relax behind oversized panoramic windows and soak up the spectacular Alpine views as you pass by. The Alps are known for their fantastic trainline itineraries and can be a great method of transport or simply a great day trip in themselves. Famous lines such as the Bernina and Glacier Express are a once in a lifetime opportunity and the scenery even more stunning and the trains less crowded during Autumn. For more information about the Exceptional Mountain Railways of the Alps check out our guide here. Crisp mornings, flurries of leaves and bonfire smoke. It’s the perfect time to hit the lakes and explore some of the Alp’s finest landscapes. The Lakes are especially beautiful in autumn and leading into winter when the you can invisage the surrounding snow-capped mountain summits and forests donning rusty colours perfectly reflected on the chilly waters surface. With reduced crowds compared to summer, it’s also the perfect time to take advantage of high-profile activities and get the lakes to yourselves. We recommend taking full advantage of the multiple boats and lake tours available where between the terraced vines, pristine waters and Alpine mountain backdrop is a real life postcard in all directions. Lac Leman (i.e. Lake Geneva) has a lot to offer. There plenty of intriguing lakeside towns and villages to be explored and we can think of no better way of achieving this than by a boat as the scenery is quite something from the lake itself. Whether a guided tour or a hop-on-and-off vessel you can get to see some spectacular places such as Geneva, Montreux and Evian-les-Bains. Other nearby yet notable lake is Annecy. For a detailed guide to Lake Annecy take a look at our Annecy Day Trip Page. Autumn is the season of harvest so as you would expect it is probably ‘the’ best season to be a Food lover. But you don’t have to be fanatical ‘Foodie’ to appreciate the seasons blessings. Any appreciator of food will relish sampling regional and rich mountain cheeses, comforting rosti, and the beloved social dishes of fondue and raclette. This time of year also means you get to attend the local harvest festivals and get involved first hand to see the local delicacies and folkloric activities. Fine wine enthusiasts and self-acclaimed ‘connoisseurs’ are also more than catered for with mountain vineyards such as those in Lavaux very proud to showcase their years produce on a number of dedicated wine tours or events as popular landmarks. The brewers and distilleries are no different pushing their home-made schnapps, festive glühwein/ vin chaud and local beers. Those wanting to learn the tricks of the trade are recommened to book into a cheese making demonstration, get stuck in working in an authentic vinyard in return for wine or perhaps book onto a cookery course or holiday such as those run by ChamChef. Besides the train, the boats and the Alpine lifts, it is also possible to do explore the mountains by your own steam. Hiking, road cycling and mountain biking in the mountain valleys or for those wishing to work hard up at high altitude are also a valid option. In fact if you don’t mind the little extra effort this normally means you get the legendary cycling cols and mountain trails to yourself. There is a lifetime of routes to explore so make sure you take advantage of the many cycling and hiking maps and itineraries available at the various tourist offices in the region. An added advantage at this time of year is that it is mushrooming season. So if you know your Chanterelles from your Morels then there is a wide array of edible fungi just waiting for you beside the trails in the alpine forests. If you are not too knowledgable on your fungi then it would be recommended to hire an international mountain leader or find a foraging guru who does! 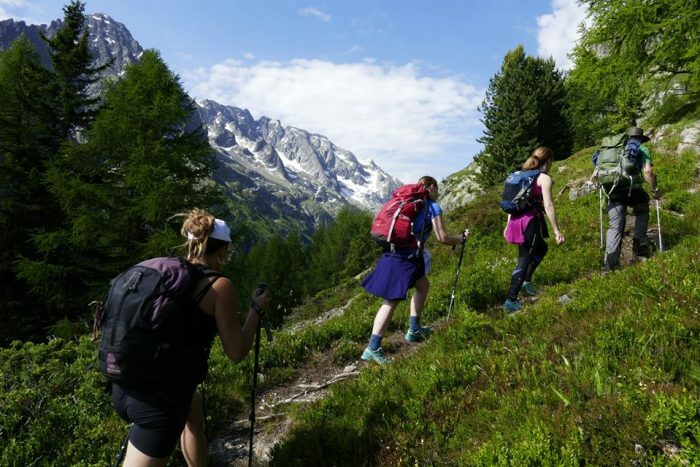 If you consider yourself to be more of a trail runner and walking to be too slow, there are a vast number of Alpine running events and itineraries throughout the Autumn. Like mentioned previously not only will the trails be quieter for you, perhaps the slightly reduced temperatures will work in your favor also? Sightseeing is not just reserved for the cities in the Alps. There are a number of geological, historical and beautiful landmarks to be discovered. France boasts rich alpine history in Chamonix where you can admire the biggest peak of the Alps and indeed Europe up close via The Aiguille du midi cable car. Or take in unusual and unique environmental phenomena such as the biggest natural amphitheater complete with in excess of 30 individual waterfalls found in the wilds of the Haute-Savoie’s Cirque du Fer-à-Cheval. You can’t beat Autumn in the Alps for awe-inspiring views, I have yet to find a more beautiful sight than the red, green, yellow and orange leaves framing the imposing white and icy blue glistening glacier in the Mont Blanc region of the Alps. Even better in the low afternoon autumnal light when the Les Bossons Glacier shines a deep orange and red colour against Mont Blanc as its backdrop which is simply stunning. This combination of factors make Autumn a photographers paradise where every angle has potential and another great shot is just around the corner…especially if you’re willing to work for it. Various local arts and crafts are generally available and fully stocked being forefront and centre with the autumn festivals in full swing so an excellent time to find hidden treasures for you Creative Crafters. Explore the high alpine the easy way with the use of cable cars, gondolas and funiculars up to the high points. The aforementioned Aiguille du Midi (3,842m) with its spectacular views of Mont Blanc in Chamonix is a top tourist choice open all year round but there are plenty more to choose from throughout the Alps. For instance the Klein Matterhorn in Switzerland where you can explore the Matterhorn Glacier Paradise the highest mountain station in the Alps and viewpoint in Europe at 3,883m. A rather unique cable car ride can be experienced in Cabrio, Switzerland which features a cable car with an open air top deck so you can feel the wind in your hair as you ascend or descend. This provides unrestricted views and photo opportunities of Lake Lucerne below and its destination the 1,900m summit and revolving restaurant of Stanserhorn. So there you have it! Our Top 10 things to do in the Alps this Autumn. If this doesn’t convince you, then we don’t know what will! We love it…if you hadn’t guessed already!! !